Position the 3D shape with the flap in the upper position (think of this flap as the back of a high chair). Locate the vertical tile directly below the top flap and rotate it 90 degrees into an horizontal position against the seat of the chair. This move entails considerable strain on the wires, and results into a flat shape of area 5 (there is a stack of three superposed tiles and a stack of two superposed tiles). Now a pair of two adjacent tiles can be rotated 180 degrees to obtain a new flat shape of area 4. The flap on top of the stack of four superposed tiles can now be rotated 180 degrees. 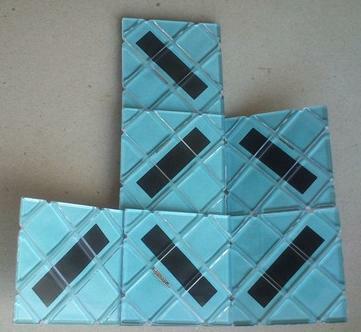 Finally a set of two tiles can now be rotated 180 degrees into the final shape.